Scientists from the International Livestock Research Institute (ILRI) have developed a step-by-step explanation of the methods to be followed in making silage from fresh herbage and methods of storing and prevent spoilage. 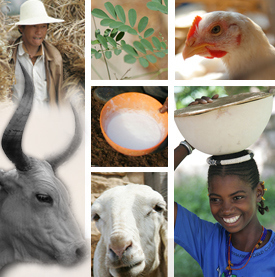 This extension brief by ILRI researchers and partners in Zimbabwe, shares the principles of silage making that smallholder farmers can use to make forage for feeding their animals in dry seasons. According to the authors, silage provides a means to conserve forage in as near a form to the original forage as possible but its high production costs mean it is mostly used in highly profitably enterprises such as dairying. 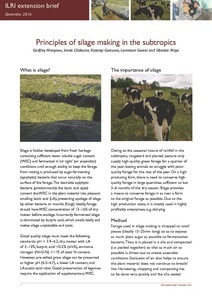 Download the brief: Principles of silage making in the subtropics. Tags: silage, ZimCLIFS. Bookmark the permalink. My name is Kibur Admasu from Tantex PLC. We are interested to commercialize fermented stover in Ethiopia. We couldn’t find any one doing it? Is there any? We have learned International Livestock Research Institute (ILRI) in Ethiopia have tried it without inoculants and they were successful. But why not commercialize it? could you give us your experience? I would like to thank you for your professional cooperation. What are the bigest challenge in commercialization of silo corn silage in subtropics? You are right. Sometimes back, we have successfully made corn silage without additive in a cemented trench silo at Debre Zeit research station. But, frankly speaking, that was made for dairy cows on station, not for commercial purpose. Why not commercialize? A good question which requires investigation of different market factors for the area you want it produced and marketed. We are very happy to discuss if you are around. You can email me or give me a call.